Even before Chloe Dao won the second season of Project Runway, she was a star in Houston, dressing the pretty young things about town. Since being crowned Queen of the Runway, Dao has expanded her empire and her Kirby store. She introduced a line on QVC and finally moved her sewing room out of her suburban garage. Dao Chloe Dao (formerly called Lot 8) is understandably heavy on Dao's colorful collections, but she also rotates other labels through the racks and frequently hosts fetes for local charities. Want a custom Chloe? Even though she's busy, Dao still designs one-of-a-kind gowns for clients. 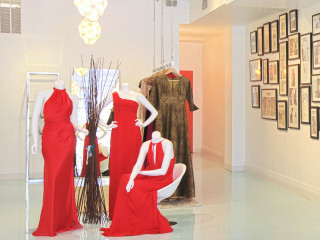 Dao named her boutique after her many supportive siblings. She is one of eight.